Who would win the race for the seventeen-year-old football talent? Several clubs from the Austrian Bundesliga were interested, with Ried Lasnik had a good feeling from the very beginning. Together with his brother Martin he went to the trial in the Upper Austrian-town and Ried-manager Alfred Tatar invited both of them to join. And so, almost both of them ended up playing for the “Vikings”. "Martin was really an option, but since we had similar types of players of his age in the squad, we decided to promote a talent from the area", says Tatar, whose attention to promising Andreas Lasnik was drawn by his assistant coach Gerhard Schweitzer. He still remembers the first professional steps of the talented midfielder: "He was carefree and we immediately saw his great potential. But he still had to learn that professional football required other qualities than he was aware of, such as tactical discipline. This is a learning process that all young players at that stage have to go through." 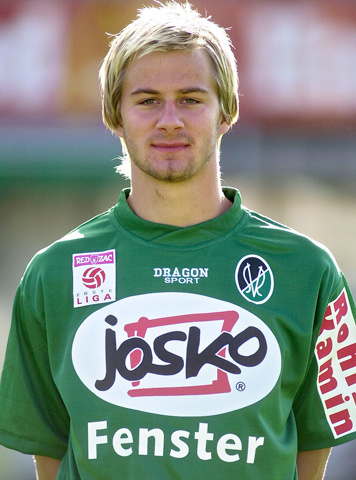 Andreas Lasnik did not have to think twice when Ried offered him a contract. The club had a good reputation for the development of young players and former player Gerry Strafner, who grew up not far from Andreas and had led the club from Upper Styria to huge triumphs in Austria and Europe, advised him to the transfer. And so Lasnik left his home province Styria and his family behind for the first time and signed for the team of Alfred Tatar. "For me it was just the right step at the right time. I was immediately in 18-man-squad and after for three games I gave my debut against Austria Vienna." The friendly and cosy atmosphere at his new club made the teenager immediately feel home. "The team-spirit was unique and that's what set SV Ried apart. I got along well with everyone from the start, no matter whether they were players like Andreas Wieland, Zjelko Radovic, Jürgen Kauz or club-legends like Drechsel, Glasner or Angerschmid. Of course it was a big step for me as an athlete as well as a person. But it was what I had always wanted and so did the positive aspects clearly outweighed any negatives." After a series of very weak performances in the spring, the club was relegated to the second division on the last matchday of the 2002/03 season. A memory that is still quite painful for Lasnik. "In a very important match in Bregenz, that we lost 0-2, I was partly responsible for a conceded goal. So the manager kicked me out of the squad for the last game of the season." But things evened out. Two years later, Lasnik would in fact, be the much-celebrated hero wearing the shirt of Ried. His deciding goal in a 3-2 victory against Gratkorn on May 24, 2005, just one match before the final game of the season, secured the return of his club to the Austrian Bundesliga. Lasnik`s days in Ried were like a rollercoaster-ride. Alfred Tatar, Gerhard Schweitzer, Klaus Roitinger, Petar Segrt, Andrzej Lesiak and Heinz Hochhauser were the coaches and care-taking managers he met in his two-and-a-half years in Upper Austria. According to Lasnik it was Hochhauser who had the biggest impact on his career. "He knew what he had to do to make players live up to their full potential. He was respected among the players and he always had an open ear for your problems." Heinz Hochhauser vividly remembers the time when he had Lasnik under his wing. "Andi was a player who was technically very gifted. But young and inexperienced as he was, he believed that it is enough to fire spectacular shoots or be dangerous on the set-pieces. He kept working on himself and developed very positively. And of course, his goal brought Ried back into the first division. Something I will never forget. " That goal was not all he contributed to the success of his club that particular season. Overall, the then 21-year-old had scored ten goals and set up twenty goals, which earned him the award "Young Star of the season". "It was a good time for the next career step. The GAK showed interest, but this time I wanted to play for one of the big names in the country."